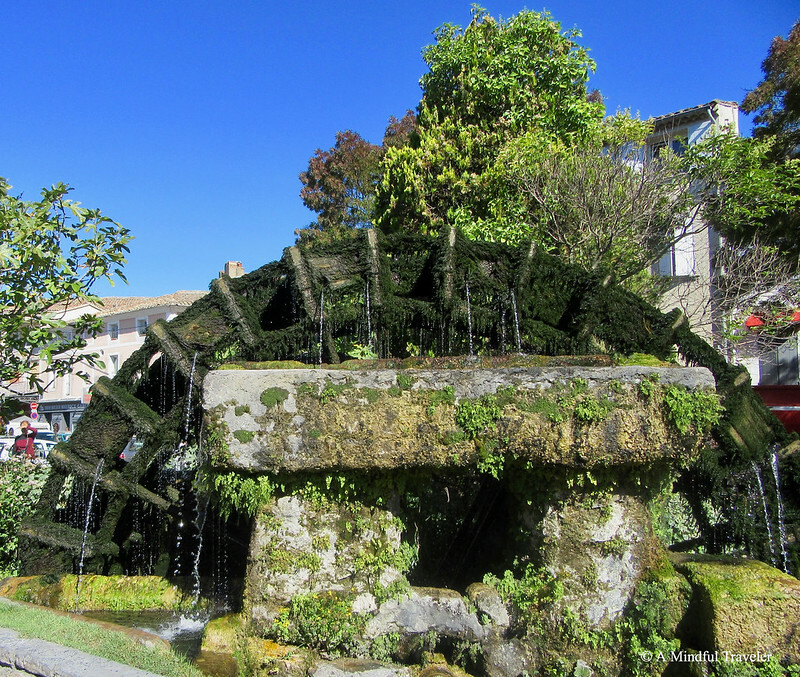 The giant water wheels of L’Isle sur la Sorgue once aided the town with assisting the mills that manufactured products throughout the silk and paper industries. Fifteen of these wheels still remain and are in working order today. 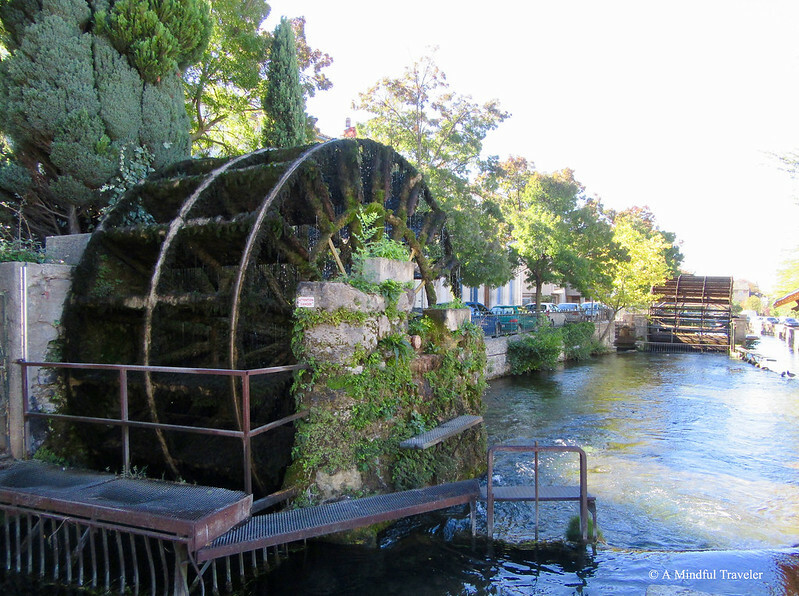 These giant moss-covered wheels are located within the beautiful waterways of this historic French country town. At the Office de Tourisme (the former public granary), you can pick up a detailed map which will show you exactly where to find them or alternatively undertake a guided tour and stroll around the town. 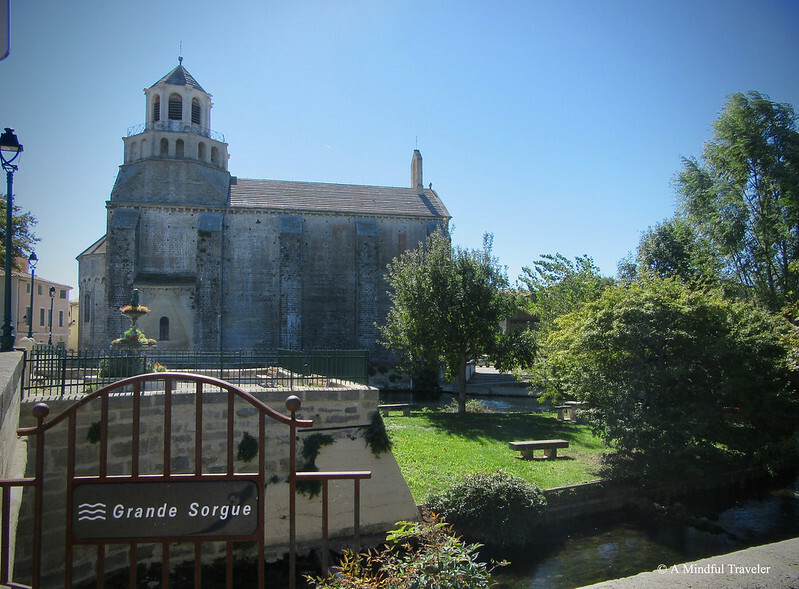 The medieval town of L’Isle sur la Sorgue is built on the islands of five branches of the Sorgue River, 7 km downstream from its source at Fontaine-de-Vaucluse. 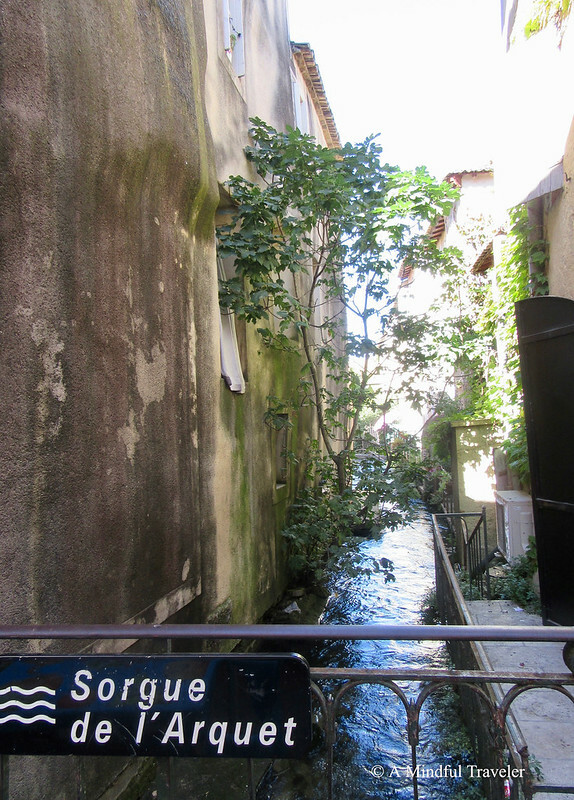 It is commonly referred to as the Venice of Provence, and rightly so. The similarities of the old town pedestrian streets of L’Isle sur la Sorgue and the narrow streets of Venice are recognizable. The adventure of discovering something new awaiting at each corner of tight, winding streets is present. Getting lost within the streets of the old town is half the fun. 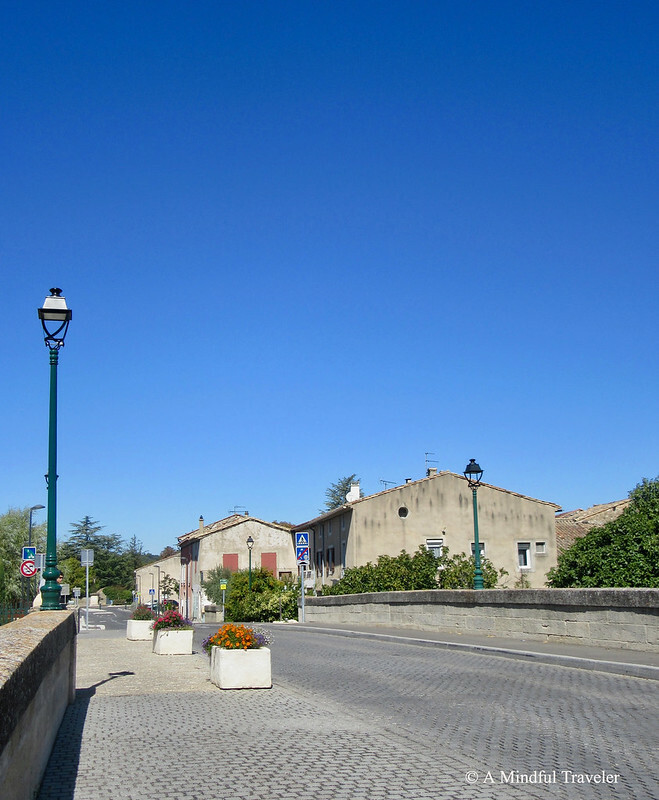 Unexpectedly encountering a bridge or crossing over the Sorgue, brings a completely different sense of the town. Calming and tranquil. 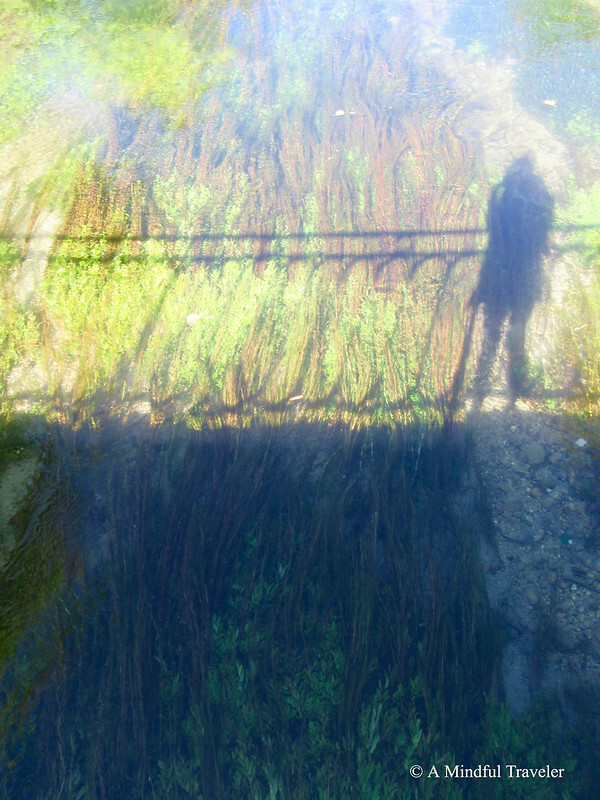 Reflections of blue sky and green foliage duplicating beauty above and below. The canals of the river gently weave through the island. Interlacing and wrapping itself, the water meets the great wheels, creating a soothing effect as the wheels turn with the weight of the water. A feeling of almost sedation, compels the need to watch the wheels unremittingly. 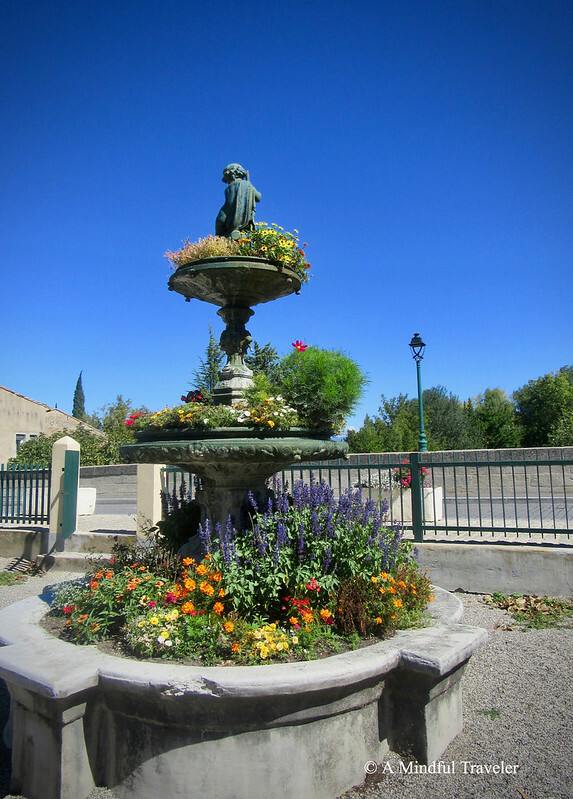 L’Isle sur la Sorgue, is home to nearly 300 antique and second-hand stores and dealers. Weekend markets attract antique lovers and art collectors from far and wide. During the antique fairs at Easter and August 15, international buyers arrive resulting in over 500 antique stalls. Mansions converted into art galleries and terrace cafés and restaurants entice visitors, tourists and locals alike. This cute medieval town with its overhanging plane trees and large, lovely waterwheels is sure to impress. 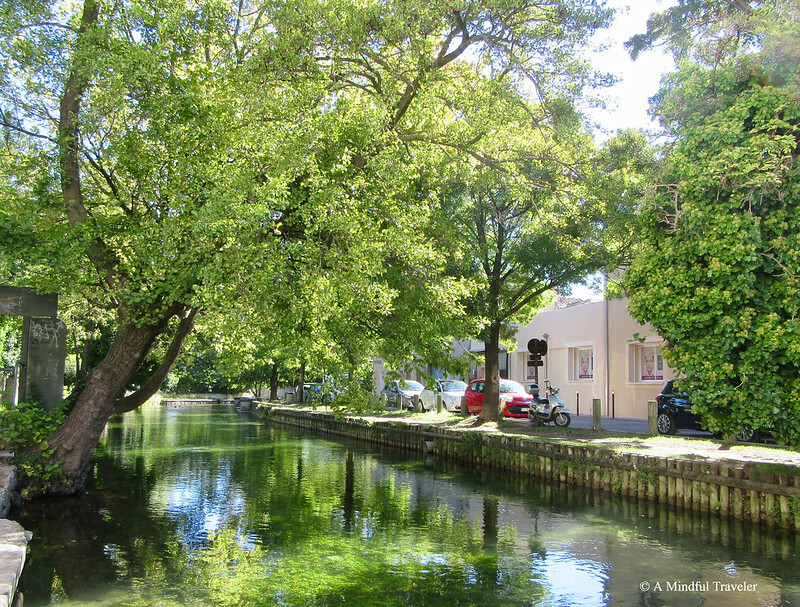 Let yourself be captivated by Provence’s L’Isle sur la Sorgue old world charm. 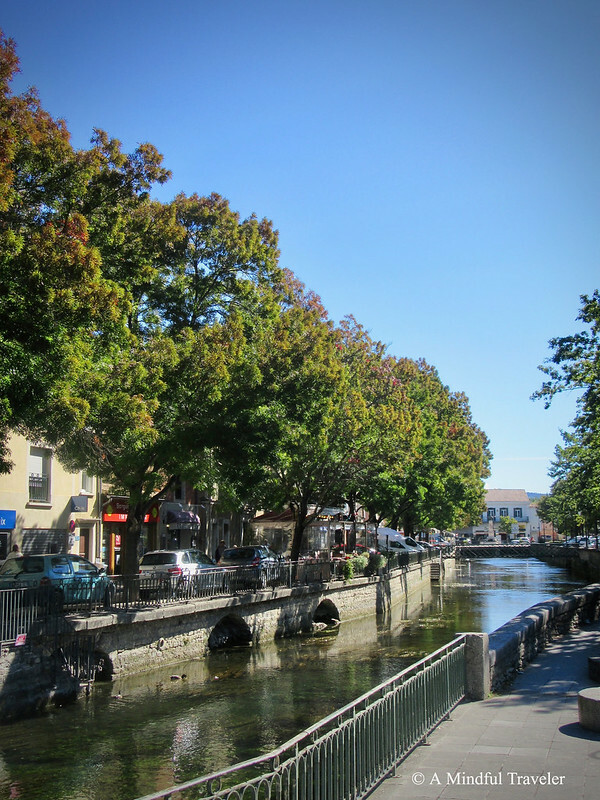 Tip: leave your car in the parking lot provided before entering the town and stroll the streets and waterways by foot. Other activities : Hiking, horseback riding, swimming pool, tennis. 18-hole golf course, fishing, kayaking. Market days: Thursday and Sunday mornings. There are several trains a day on the Avignon line, and it’s only about 30 minutes between Avignon and Isle-sur-la-Sorgue. Vaucluse bus line connects Avignon, Morières, Châteauneuf-de-Gadagne, Le Thor, L’Isle-sur-La-Sorgue. This looks like an interesting place to visit Lorelle, love all the history. Gorgeous place and photos! Looks like you had a ball. My sister-in-law and her husband would love it here they absolutely love antique shops and second hand things! Growing up, we visited a working water wheel at Roslyn Park, Long Island. That one has slipped into the past. I love those old waterwheels! Looks like a charming town and well worth a visit. A great post that takes you right there. It’s gorgeous! I’ll add it to my bucket list! I love these tiny, quaint towns that you share about. Definitely worth visiting. Loved the pics as well! So pretty! It would take forever to investigate all those antique shops but I bet there would be some treasures inside. 300 antique shops! What a town that must be! Hello. You have found a very beautiful place. I enjoyed every photo. Thank You. Such a lovely , charming place am sure you had a great relaxing time ! It’s sounds utterly divine. Even your description relaxed me. I keep reading the post again and again,from your descriptions to your photography skills,kudos to everything.This is straight going to my bucket list.Hope you are doing well.Take care. Hey Neha. All well here, busy times though. Hope you are doing well too. 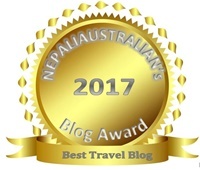 Thank you so much for your kind words. Glad you enjoyed it. If you are willing to send the tickets? why not? I loved the post immensely. you too have a great weekend. Thanks Carol, I agree, truly magical. All well here too, busy time of year as kids are finishing school and I am busy with work. I too have been busy with the Christmas baking!